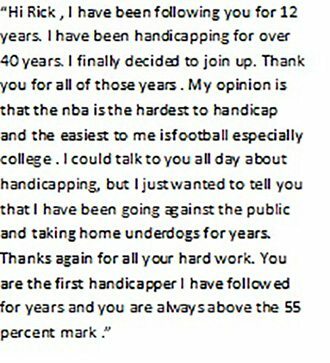 Another 3-1 Day for RickJ's Handicapping Picks!!! 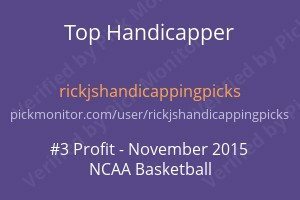 8-3 first five days of Nov for +5.79 Units!!! Another 3-1 Day for RickJ’s Handicapping Picks!!! 8-3 first five days of Nov for +5.79 Units!!! After a big start to November the NFL has let me down going 0-2 today in the NFL and 2-3 in the Hilton Contest. There are 3 more one unit plays pending so today’s outcome is still up in the air. 2 plays in the NBA and 1 in the NHL. Betting is 60 % on Denver and the line has pick across the board with the exception of pinnacle who has the game at -1-106 Oakland. I don’t think you can draw any conclusions from their line being a bit different. Models favor Oakland while Variables are split on the game. Public betting does not tell much either as to giving any clues on the game. For me this game is a clear cut pass. Saturday we had another busy day with 4 one unit plays going 3-1. In College football we had two cliffhangers with Kansas +31.5 down by 31 at the half but hung on to cover 21-48 and Oregon State +16.5 covering 15-26. In the NBA we had an easy one unit win with the Clippers +5 blowing out the game 116-92. And in the NHL our loss with Florida +160 losing 2-4. Today so far we have a one unit play pending. Football has been very good to us this season with College Football one unit plays going 21-13-1 for 61.76% and the NFL 9-4 for one unit plays or 69.23%. In the Hilton NFL Super Contest I am sitting at 21-14 or 60% going into week 8. I have been in much worse positions and made a nice run to cash. Sitting at 60% almost half way through the season is not a bad spot to be as any kind of monster run will get you into the top 50. I most likely am sitting around 100 or so. This was another tough week for picking games as models for the most part did not agree with variables on most games. As far as alternatives to the above games surprising when I was finished handicapping these were the only 5 under consideration. Usually when it comes down to the 5th pick I have several alternatives but this week there was none. This is why there is value in the Hilton NFL Contest, or I should of said was value until they decided to take 8% off the top. But for me its a mode of advertising and also for those joining me in the contest a way to enjoy the football season and have a chance at a % of 1,000,000. Only 3 games below 60%. The animal spirits are very high today! Lets see if its going to be that easy:) Usually its not! There are several games today that have very interesting numbers. If I get a chance before game time I will comment on a few of these games. Also on my to do list is a FAQ section to make a few things clearer on this site. Its very easy to assume that everyone knows how to maneuver around the site and also how to sign up. But from some of the questions I am getting it seems that is not the case. In addition I have tried to make it as easy as possible to review the past records for all the sports. On top is a page that has all the results going back awhile. They are separated by year and sport. I usually update that page daily. The link on the banner is broken and I need to fix that so to subscribe, the method is to use the pay-pal drop down menu and pick the subscription option of your choice. All have a 3 day free trial. And the subscription amount that is there is correct. For those of you that are used to seeing a lump sum of 1500 for one sport as your subscription option you will be surprised at how little the subscription to these plays are. In addition I am usually available for questions via email any time of the day. I check my emails often. Direct messaging is hit or miss.